i have created art, evolving from found-object electric assemblage sculptures in the late eighties to large-scale sculptures covered with thousands of mosaic pieces of tile and glass now. i have designed and constructed murals, sculptures, benches, bollards, and enhanced the surfaces of columns, wall,s and floors with mosaics in my signature gaudi-inspired style. each of the many public art installations that i have created were designed specifically for the site with form, function and imagery that were related to the surrounding built environment with historic and cultural influences reflected in the design. i use steel and concrete to create the base of my pieces and cover it mostly in mosaic glass and tile. mosaics can be in mural form to tell a story or mosaics can be decorative as they cover, arches, floors, and walls. 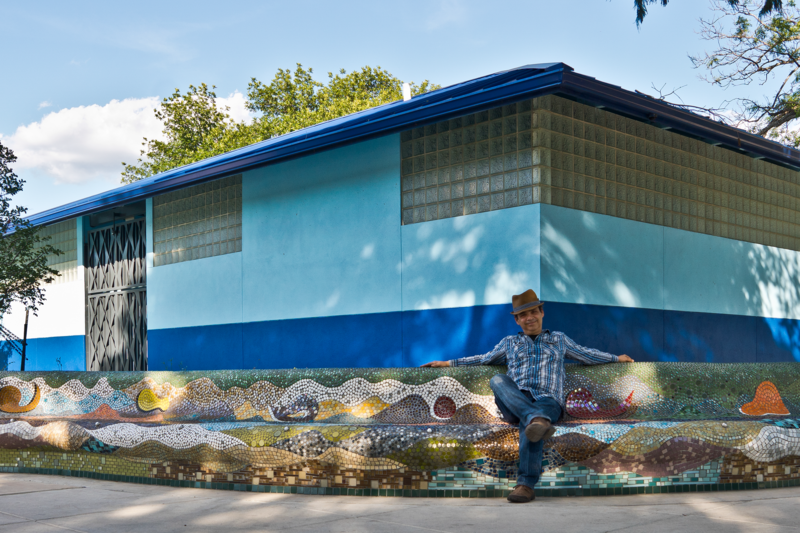 i use mosaics to complete concrete sculptures and benches, on bas relief and on bollards. as i grow as an artist i intend to continue creating larger pieces in more public places. i look forward to the continually unfolding challenge of creating context-appropriate work that both serves a purpose and satisfies a vision. i plan to create some pieces that are representational, some that are functional, and some that are just art. as a seasoned public artist, i produce quality public art that satisfies the goals for each installation and i have also achieved the additional goal of creating a sense of place with much of my site specific public installations. artistic enhancement of public spaces creates a beautiful, unique, and more memorable city and i am committed to the “thousand year solution” of making art that is built to last. 1001 roosevelt ave, san antonio, tx 78210 [map] +1 (210) 862-1293 [call] [sms] oscar@oscartist.com [email] © 2019 oscar alvarado. all rights reserved.